These 'false majorities' are a symptom of a system that's out-of-date and needs an upgrade. What kind of a democracy elects majority governments without the support of a majority of voters? 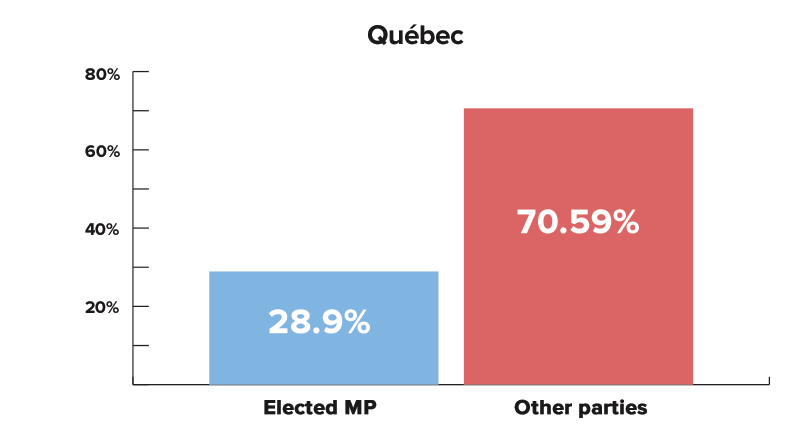 Canada’s First-Past-the-Post (FPTP) electoral system works on a ‘winner-takes-all’ basis – whoever wins the most votes wins a seat and whoever wins the most seats forms government. That could be a good way of picking winners, but it also means the voices of millions of voters get left out of parliament. There have been only three Canadian elections since 1921 where a party has formed government after receiving more than 50% of the vote. The same thing happened last October when Canada elected a majority government with 54.4% of the seats even though they received 39.47% of the overall vote. 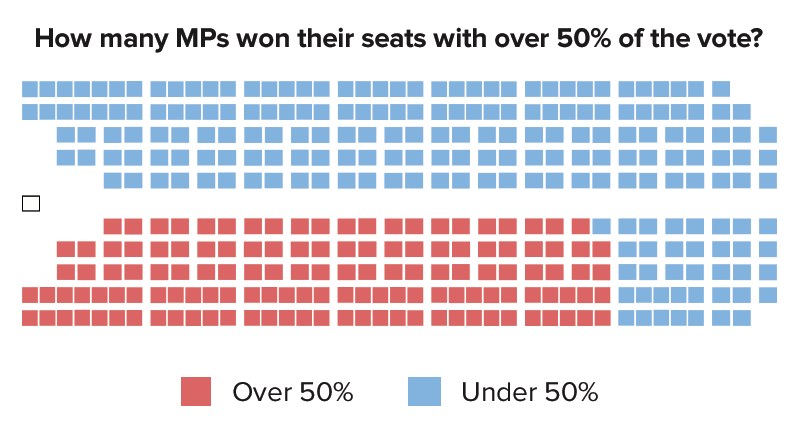 And on a riding-by-riding basis, 205 of the House of Commons’ 338 seats were won with less than 50% of the vote during the 2015 election – that’s 60.65% of all seats awarded to MPs who received less than 50% support from their constituents. 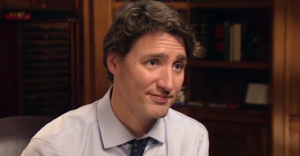 FPTP isn’t designed to work in Canada’s modern, multi-party democracy. These ‘false majorities’ are a symptom of a system that’s out-of-date and needs an upgrade. 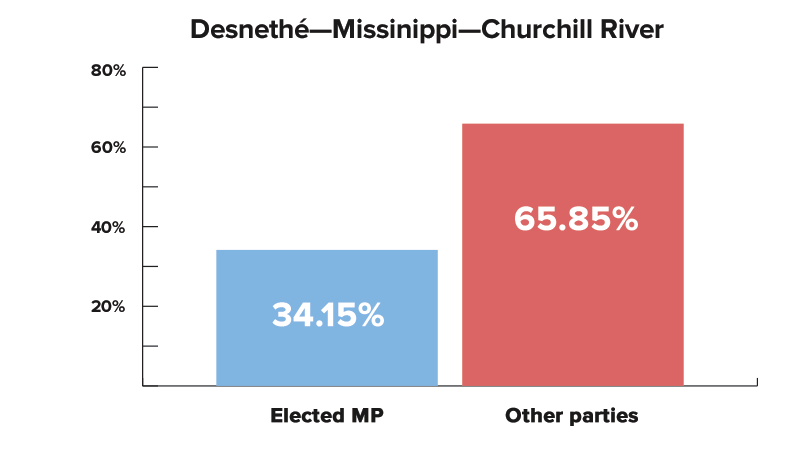 Conservative MP Bernard Généreux won his Eastern Quebec riding with the support of 14,274 voters in his riding, even though 34,682 people in his riding voted for candidates from other major parties. 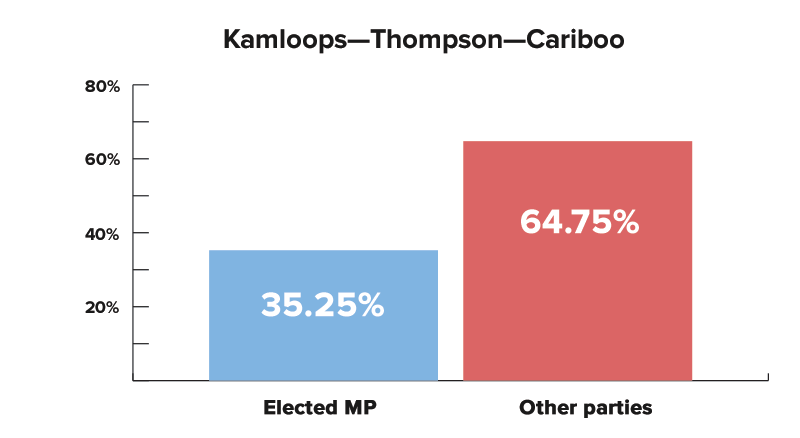 Conservative MP Cathy McLeod won re-election with 24,595 votes, except the second place NDP candidate received 21,466 votes and the third place Liberal candidate received 21,215 votes. 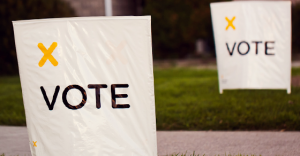 Together, voters in McLeod’s riding cast 45,170 votes for NDP, Liberal and Green candidates. Families, Children and Social Development Minister Jean-Yves Duclos won his Quebec City seat by just 1,000 votes. But 38,026 of the 53,867 valid votes cast in 2015 were for candidates from the NDP, Conservatives, Bloc or Greens. It took a judicial recount to declare NDP MP Georgina Jolibois the winner of her northern Saskatchewan seat. 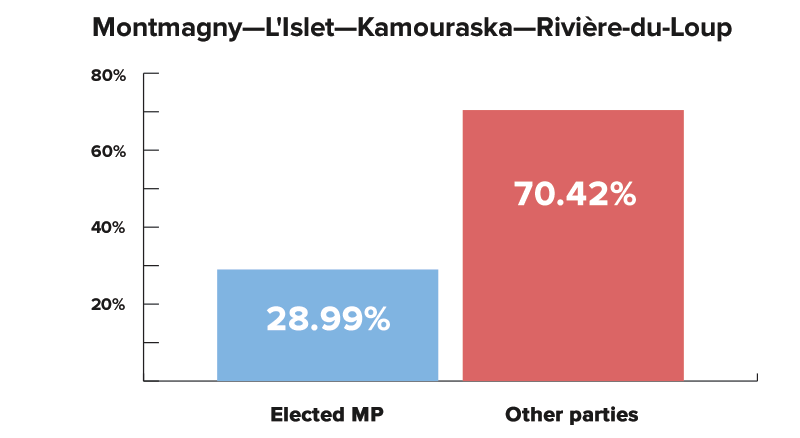 Although Jolibois won the seat with 34.15% of the vote, 65.85% of voters cast votes for the Liberals, Conservatives and Greens. Conservative MP Marilyn Gladu won the Southwestern Ontario riding of Sarnia-Lambton with 22,665 votes. But 35,560 votes were cast the NDP, Liberals and Greens. In each and every one of these ridings (and about 200 more), although the winner received the most votes, the majority of voters marked an X for somebody else. Why deny so many voters a voice in parliament? Photo: dolmansaxlil. Used under Creative Commons license.